Obituary for Robert Lee Rieman | Hunter Funeral Home, Inc.
Robert Lee Rieman, 84, a longtime resident of Columbus passed from this life and into the next at 10:30 AM on Monday, September 3, 2018 After a long struggle with Lewy body Dementia, in the North Adams Home in Mendon. Robert was born in Rockwell,Iowa on May 7, 1934 to the late John and Grace (Shepherd) Rieman. He was the youngest of their five children. Robert grew up on farm in central Iowa, his formal education ending with the 8th grade, he worked at a variety of agriculture jobs and in 1951 met and married Neva Nell Russell. The first of their four children was born in 1952. In 1962 Robert moved his young family to Quincy, where he took employment with the Moorman Manufacturing Company, first as a line worker and then as a mechanic in the garage. He spent over 25 years with Moormans , then moved to Quincy Mack working as a diesel mechanic with his good friend Steve Grotz, retiring in 1998. .
Robert enjoyed boating, water skiing, pitching horseshoes (and drinking beer) camping, fishing and hunting especially pheasants at which he was a master wing shooter. He also enjoyed a glass of wine while playing card games with family and friends and taught most of his grandchildren how to play the games he so enjoyed. Robert is survived by three of his four children, sons Robert Allen Rieman and Randall John Rieman, his daughter Karen (Steve) Wellman, seven grandchildren, thirteen great- grand children and numerous nieces and nephews. Robert was preceded in death by all four siblings, John “Son”, Goldie, Harry and Louise as well as his first wife Neva Russell and second wife Shirley. Services will 12:00 P.M. on Friday, September 7, 2018 in the Hunter Funeral Home in Golden with Randall J. Rieman conducting. Interment will be in Golden Memorial Gardens in Golden. Visitation will be from 10:00 A.M until the time of services on Friday, September 7, 2018 in the Hunter Funeral Home in Golden. Memorial contributions have been suggested to the Alzheimers Association or North Adams Home. 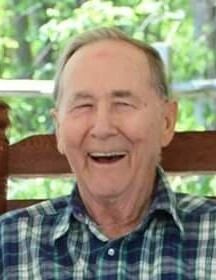 You are invited to share memories of Robert and leave condolences at www.hunterfuneralhomes.com.